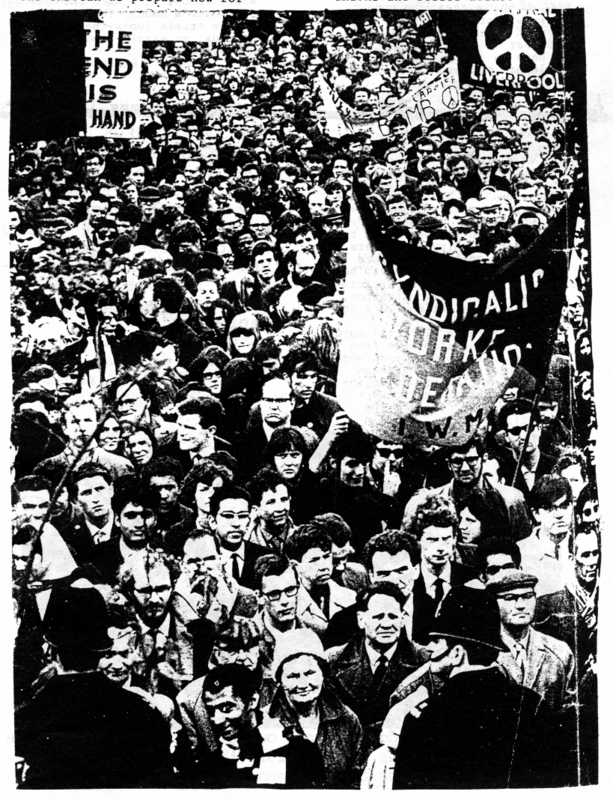 Tom Brown's 1968 description of the Syndicalist Workers' Federation, a UK based organization that was affiliated to the International Workers Association and was the predecessor to the Direct Action Movement and by extension, Solidarity Federation. When, in 1939, Fascism triumphed in Spain, the Libertarian movement was downcast, many gave up hope and departed. The social climate, too, was gloomy, for Spain had been, not only the last, but the only hope of defeating World Fascism. And in spite of those who murmured, “Now for peace, I always said they should not have resisted Fascism,” the world knew that in the same year war would again sere the earth and tens of millions would die in the rubble of civilisation. That, all knew, was the beginning; none could know the end. There were Syndicalists before and during the 1914-1918 war. They were not many, but their work in the social struggle was so earnest, so great and so apt to the workers’ needs that the class enemy numbered them as hundreds of thousands. They were the proverbial “little leaven that leaveneth the whole lump.” But, they were men of action, men of the deed, few of them had the time to write. Syndicalism was the opposite of the parties, which seem to consist entirely of writers and policy merchants. So, when men say, “Show me the Books of Syndicalism,” there is little to show. Its lasting work is the living flesh of the workshop committee idea, with is shop stewardship, which has grown till nearly every worker, be his collar dirty blue or dirty white, knows its efficacy. If you ask, “What became of all that work of the Syndicalists?” we would say, “When you see the grassroots organisation of the workers in action, bending employers, union bosses and the State to its will, think of the St. Paul’s tablet so Christopher Wren, ‘If you seek his monument, look around you’.” The only thing of value remaining out of this century’s struggles and work of the Left is the shop steward and workshop committee movement. The parliamentarians and “Parties of the Working Class” have nothing to show but Wilson and Ramsay Mac. By 1936 there was no identifiable Syndicalist movement in Britain, though the idea was still operated and individual Syndicalists practised their skills in factories, mines and on railroads. Anarchism, too, fared badly; indeed every grouping that could be called by the vague term Left had suffered at the hands of the Communist Party and the wealth of Russian money that was dedicated to smash all Left movements to make way for the sole proprietors, the party of Lenin. The big British Socialist Party was swallowed, then digested, the Socialist Labour Party destroyed, the numerous lively local Socialist groups hammered one by one. Only the ILP remained, later to fall a prey to Parliamentarism and Communist intrigue. When Spanish Fascism made civil war and was answered by Social Revolution, the group ended the paper Freedom to concentrate on the CNT-initiated English paper, Spain and the World (later Revolt) and wound up the group to merge with all others who gathered to aid the Spanish Anarcho-Syndicalists in their life-and-death struggle. They never republished their paper, Freedom, one by one they passed away and the world was poorer for their going. The comrades, mostly fairly young, who remained after the end of the Spanish struggle, reassembled; at first only three persons, who made anti-war posters and pasted them in prominent parts of London, then enough to form a group and link with groups in Scotland; the Anarchist Federation of Britain was formed. Serious discussion produced unanimity on the kind of organisation we wanted. Everyone was sickened by the coffee-bar Anarchists, who specialised in “the Ego”, individualism, hating the working class, being “anti-organisation” and forming organisations to propagate that idea, or had a new theory of society every few months. Such persons had created a bad image of Anarchism. We all wanted a sincere, responsible organisation. We wanted Anarchism to influence society, to be revolutionary, bring about change, not to be just a permanent grouse. We all insisted on Syndicalism and Internationalism, we were all anti-war. As the war developed, others joined us and we billposted, printed and published and held public meetings, indoors and, mainly, open air. Members of industry, mostly in Lanarkshire, on Clydeside and in London, took the anti-war struggle into their workplaces and unions, opposing the State, the union bosses, the employers and their Communist stooges. We stood with others, PPU and ILP, in a mutual witness against war. Direct Action was one of the very first papers to be anti-A Bomb, while the CP supported it and many others were silent. Early in 1944, the AFB resolved that when the war ended we would appeal to all Anarchist Federations abroad to meet and form a viable, militant Anarchist International. Late in 1945, the French Anarchist Federation sent out such a call to meet in Paris and form the International. In February 1946 the meeting was held, a delegate of the AFB attending. The times were right; Europe was in the melting-pot, between war and peace. Anything could happen, men’s minds were open and eager, the peoples of Europe were anti-Fascist, eager to end Franco and Salazar in the last, Iberian fortress of Fascism. People were ready for a new society, but the politicians had no answer. With hope and eagerness, the AFB delegate reached Paris, to be astounded at the well-organised opposition to the mooted International; opposition within the Anarchist ranks. The Internationalists were defeated. The majority were against the International in any case, but added the excuse, “The time is not yet ripe.” Curiously, it hadn’t been 50 years earlier. Later, the Anarchist Federation of Britain changed its title to the Syndicalist Workers’ Federation and joined the Syndicalist International, the International Working Men’s Association, of which it now is the British Section. The term Syndicalism is more acceptable to the British worker than is the theological-sounding mouthful, Anarcho-Syndicalism, and the Syndicalist ethos is to workers, and even historians, a good ethos in Britain. Some complain that the SWF has not changed its principles. That, in a world where Socialist politicians change their principles far more often than their raincoats, ought to be welcome. But the principles of capitalism have not changed: we live in a society which is still founded on rich and poor, war and class war still go on, men’s lives are still governed by property relations. What has happened to all those fabulous developments which made Syndicalism and Revolution “irrelevant” – the H-Bomb, Affluent Society, Automation? The old problems are still with us. Capitalism has no answer. The case for Syndicalism remains unanswered. It is no answer to go looking for a new butterfly to chase. From: Direct Action February 1968, vol 9 no 2. Tom Browns pamphlets read "old" and from a by gone day. But so did so much other stuff at that time as well.